Egypt's MPs are expected to pass a law requiring royalties be paid whenever copies are made of museum pieces or ancient monuments such as the pyramids. Zahi Hawass, who chairs Egypt's Supreme Council of Antiquities, told the BBC the law would apply in all countries. 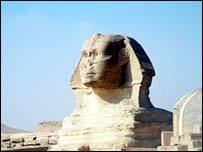 The money was needed to maintain thousands of pharaonic sites, he said. Mr Hawass said the law would apply to full-scale replicas of any object in any museum in Egypt. "Commercial use" of ancient monuments like the pyramids or the sphinx would also be controlled, he said. "Even if it is for private use, they must have permission from the Egyptian government," he added. But he said the law would not stop local and international artists reproducing monuments as long as they were not exact replicas. The Luxor hotel in the US city of Las Vegas would also not be affected because it was not an exact copy of a pyramid and its interior was completely different, Mr Hawass told AFP news agency. 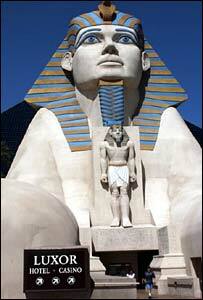 But he said claims by the hotel that it was "the only pyramid-shaped building in the world" could no longer be made. The announcement came two days after an Egyptian newspaper called on the hotel to pay a share of its profits to the central Egyptian city of Luxor, which administers the ancient Valley of the Kings burial site.